I'm currently working on implementing Wake on LAN (WOL) for a customer's network. I'll probably post more on what I've found out will researching this in the future. Today I thought I'd share a script I've created to enable the correct power management options, that are needed on the appropriate network adaptors, to ensure WOL works. I wanted a script to ensure the three options in the screen grab below are enabled. PowerShell is my preferred scripting solution, and this customer also wants as much scripting done in PowerShell as possible. I found a number of VBScripts examples that I then used to construct my PowerShell script, so I don't take credit for the logic here but I couldn't find a complete PowerShell solution so I hope this is useful for someone. I'm no PowerShell guru, so if anyone sees ways to improve this script - please feel free to share ideas. Configure a Network Adapter to Wake a Computer Via PowerShell: This article was where I found the base I used for my script in PowerShell, it shows how to get at one of the properties via WMI, after figuring this out the rest of the script was easy. My script follows below. One thing I've added that is different from the two great articles above is that I look only for physical ethernet adaptors. I don't try to configure these settings on virtual adaptors or wireless adaptors (others might want to do this for wireless adaptors, Windows 7 does support WOL over wireless, but that isn't a requirement for my customer). Eliminating virtual adaptors from being configured stops the script touching the various virtual adaptors that various remote access solutions like to add to Windows. $nics = Get-WmiObject Win32_NetworkAdapter -filter "AdapterTypeID = '0' AND PhysicalAdapter = 'true'"
Write-Host "--- Enable `"Allow the computer to turn off this device to save power`" on $nicName ---"
Write-Host "--- Enable `"Allow this device to wake the computer`" on $nicName ---"
Write-Host "--- Enable `"Only allow a magic packet to wake the computer`" on $nicName ---"
Testing today on a laptop I found the above script will identify the inbuilt Intel Centrino Ultimate-N 6300 AGN on a Dell Latitude E6510 as an Ethernet adaptor when it plainly isn't. It then fails to set some of the properties above as they are not supported. Not a big deal, the inbuilt Ethernet adaptor is treated correctly so the result is successful, but messy. I might have to use the 'netenabled' filter used in the PowerShell Guys' posting above. AND NOT Description LIKE '%Bluetooth%'"
I am wondering. 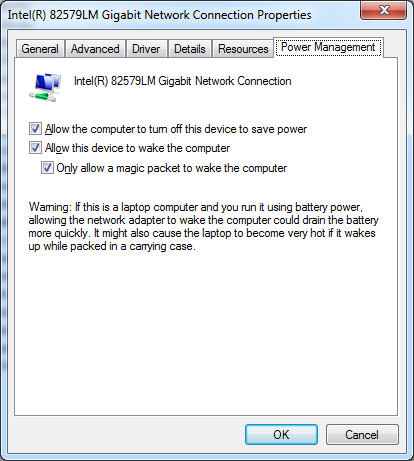 We also need enable "Shutdown Wake Up" in advanced settings of nic to be able to wake that computer via network. But I am not able to find that class in wmi. Thanks for posting this script. I'm working with it to turn ont he NICs in my company's computers. I'm having one problem. It works on our laptops, but not our desktops. The desktops are using Intel 82578DC gigabit ethernet cards. Any idea why that would be? Any pointers would be awesome! Hi Ondrej - Sorry for the slow response, I've been busy with other things and haven't been here since late December. I did have another post to go on how to configure settings on the advanced settings tab for a NIC, but haven't posted it. I'll see if I can find that draft and get it posted, or a least post back here with some comments on the solution. I had to solve a similar problem when I was doing the work above. Just posted some Windows PowerShell code below that might help you figure this out. I hope it is of some use. This is great for windows7 and higher machines but can you post a vbscript version. I still have a huge number of XP machines and they don't have powershell installed. Wondering if there is a Windows 10 update for this? I see it is erroring out in our Windows 10 device event logs. I assume the WMI objects have changed?